What is your favorite part of the roller coaster experience. Most of us enjoy the entire ride, except for the sudden jolt of the stop at the end which we can make a metaphor for death. But before you continue reading ponder your favorite part. Here are 4 for your consideration. 1. the Climb 2. The Free fall 3. The Recovery 4. The twists and turns. We love the climb because it is full of anticipation. As in life anticipation is a great part of the joy. This is the essence of dreaming and planning. With each clink of the chain we climb higher and higher getting a better view on our way to the summit. The free fall is fun because is scare the mess out of us. Our bodies and mind are suffering from sensory overload and we are overwhelmed with the realization that we are not in control nor are we going to be for some time. I love the recovery as you come to the end of the free fall and have weight again. Everything suddenly comes back to normal and although there are twists and turns ahead, at least we can catch our breath and gain our composure. Twist and turns can be anticipated but not overcome, they have a way of throwing you from one side of the car to the other and either being close to the one you love or way to close to a total stranger. Such are the twists and turns. Do you have a favorite part of the coaster? 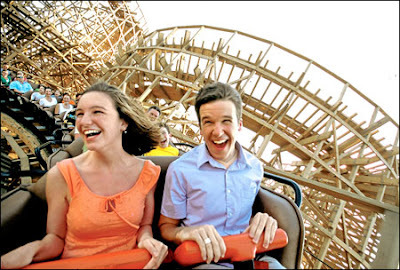 Do you have a favorite part of the roller coaster that is our life? Life is full of ups and downs, of twists and turns and I must admit that I prayed that if God would stop this roller coaster that I would gladly get off. You see, roller coasters are no fun for those who are afraid of them. My wife is one who can't stand them. She has ridden some with me, but in the process would close her eyes for the entire ride. We all know that closing the eyes just makes it worse, but those who are afraid don't agree. There are those who ride life's coaster with fear. Closing their eyes as if ignoring the ups and downs will miraculously flatten them out. I feel for them. I know that life is difficult for them, and I long for them to enjoy the ride. There are also the screamers. These are the ones who mock the fear by screaming at the top of their lungs. Their yells are not an expression of their fear, but the denial of such. Like it or not life is often a roller coaster and therefore we have to treat it as such. It is my goal for you to enjoy the ride. Let the climb bring anticipation and faith in the heights that your journey might take you. There is no telling how high God's plans are for you. Let the free fall help you understand that you are not in control. That long before you got on this ride that a designer planned for your ride. Respond to those free falls by holding on tight to the grips if you must, but those with great faith in the designer have learned to raise their hands even during the free fall. Let the recovery build your faith in the designer. And with every recovery from every free fall, may you grow in your knowledge of His design and plan your the ups and downs in your life. Let it help you to regain your composure and prepare for the twists and turns ahead. Finally, let the twists and turns in life bring you into closer contact with the ones you love, let it pull you together as you laugh and scream in tandem. On the same note, if you happen to be going through this ride with a total stranger, you will likewise laugh and scream together and will go away from that shared experience with an unusual bond. So for all you Cars fans out there, life is not a highway, it is a roller coaster and Oh what a ride.